Obituary – Taylor, Gene « Perry High School Alumni Association, Inc.
Gene Taylor, 75, was found dead early Monday, July 6, 1998 at his home at 800 Cedar Street. Funeral will be at 2 p.m. Wednesday in the chapel of Brown Funeral Home. Rev. Tim Boggess, pastor ofthe First Presbyterian Church, will officiate. Burial will be in McGuire cemetery at Lucien. Taylor was the son of Eugene and Ollie (Goss) Taylor and was born in Perry on Oct. 26, 1922. He began work as a newspaper carrier for The Perry Daily Journal at about age 12. He graduated from Perry High School in 1942. Taylor was a Journal employee for more than 50 years, having served as city circulation manager and later as news reporter and photographer. He was managing editor when he retired in February, 1997. Through his newspaper work, Taylor had a close relationship with members of the Perry Police Department, Noble County Sheriff’s Department, Perry Fire Department and the Oklahoma Highway Patrol. He was a volunteer fireman/dispatcher for the Perry Fire Department for 20 years. Taylor twice was named honorary mayor of Perry. Ten years ago Perry’s Brogan Street was renamed Gene Taylor Street in his honor. On Feb. 3, 1997, he was recognized by the Perry City Council for his many years of reporting council meetings for The Perry Daily Journal. 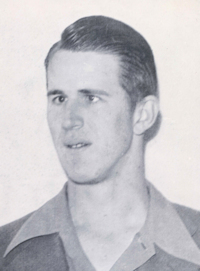 In 1997, Taylor was inducted into the Oklahoma Press Association Half-Century Club. As an honoree, he received a diamond pin and certificate in recognition of 50 years of service to Oklahoma’s newspaper industry. He was affectionately known as “Scoop” by many residents of the Perry community. Memorial contributions may be made to the American Cancer Society or the Perry Fire Department. Survivors include two sisters, Frances Copeland, Pauls Valley, and Marie Rhodes, Oklahoma City; one brother, Glen Taylor, Oklahoma City; three nieces, Marilyn Rhodes, Evergreen, CO, and Mary Miller and Betty Colvin, both of Oklahoma City; and four nephews, James Rhodes and Gene Rhodes, both of Moore, Kenneth Rhodes,Oklahoma City, and Glen Copeland, Pauls Valley. He was preceded in death by his father in 1956 and his mother in 1970.